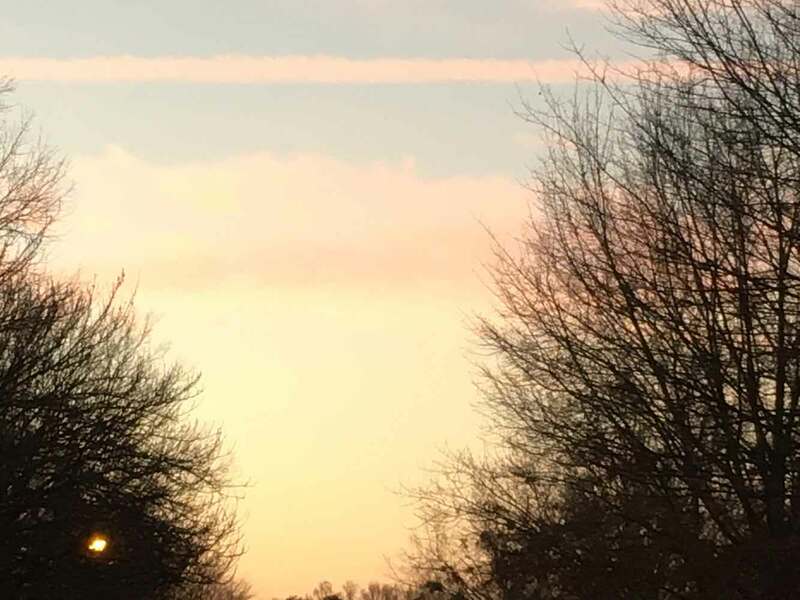 How did it get to be the middle of February already? I think it's time for a work-in-progress update. 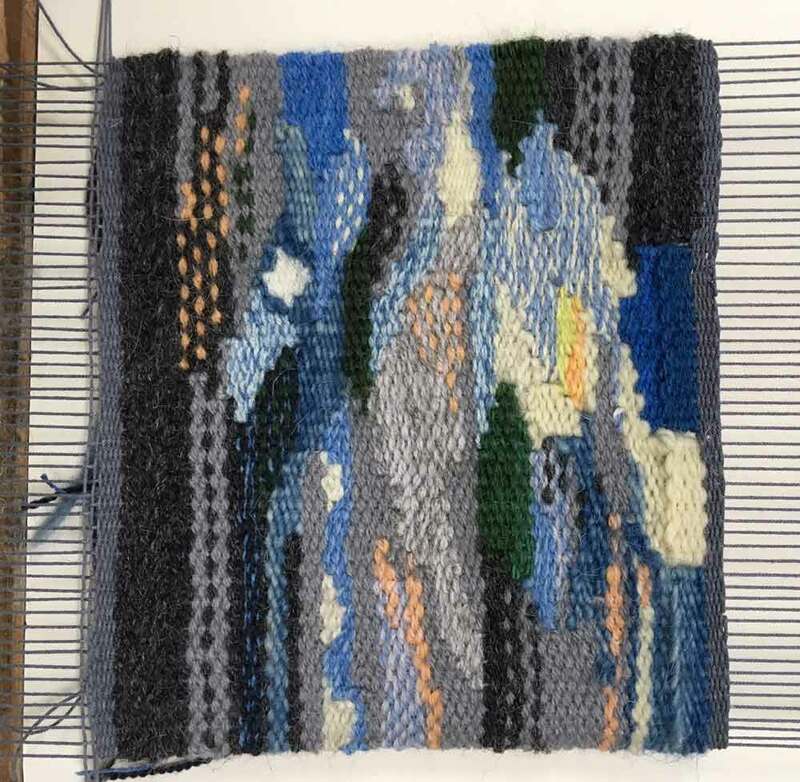 This year's tapestry diary is taking shape. 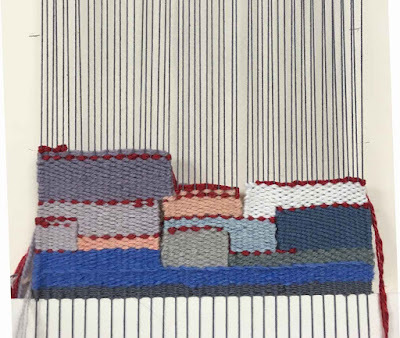 I'm weaving a 5" x 7" piece for each month, inspired by things I see on my morning walk. In January I wove irregular bits every day, responding to something I noticed in the landscape or the sky. 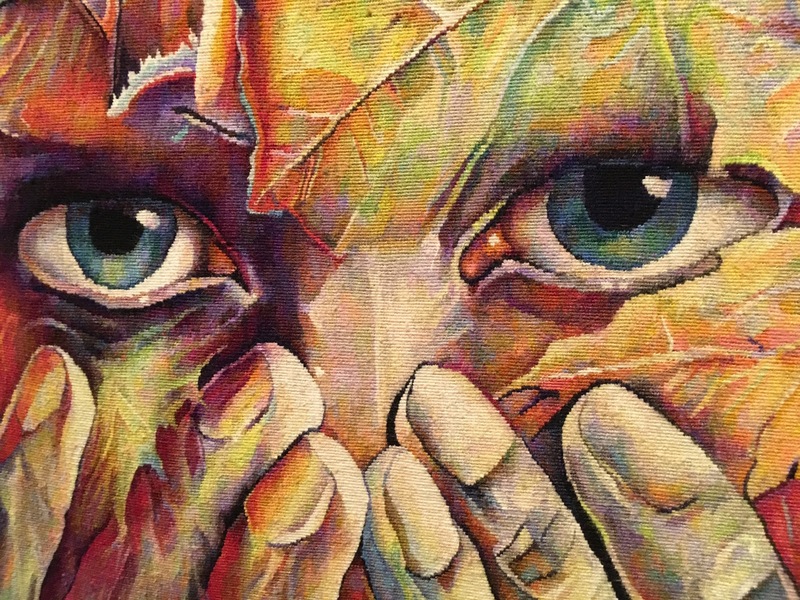 Here's January's piece completed and turned to its correct orientation. Not too bad for weaving without a cartoon or much of a plan. I like how the gray stripes and dotted lines sort of look like streets I walk on. . . . 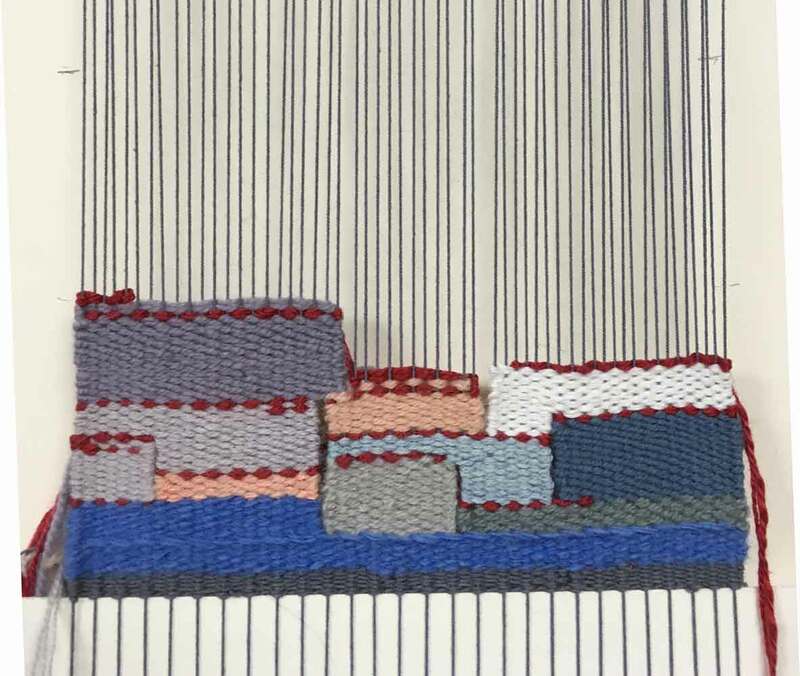 This month I'm choosing one color from the morning sky and weaving a rectangle-ish shape, I finishing with half-passes in red that indicate the date. This one will also be turned sideways. . .maybe it will look more interesting that way! I'm excited to have Mom's eyes just about completed, though I'm going to tweak the one on our right one more time. For the record, that would be the fourth try on that eye and the second on the other one. About the standard number of iterations for me! I wish progress would come faster on this piece, but I have to admit that I'm distracted by this other, newer one, on the floor loom. 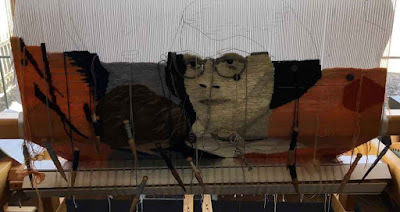 I'm weaving this one from the side so the left-hand edge in the photo is actually the bottom of the tapestry. This is Mater Dolorosa, a dark, quiet piece mostly done in natural-colored Churro wools. 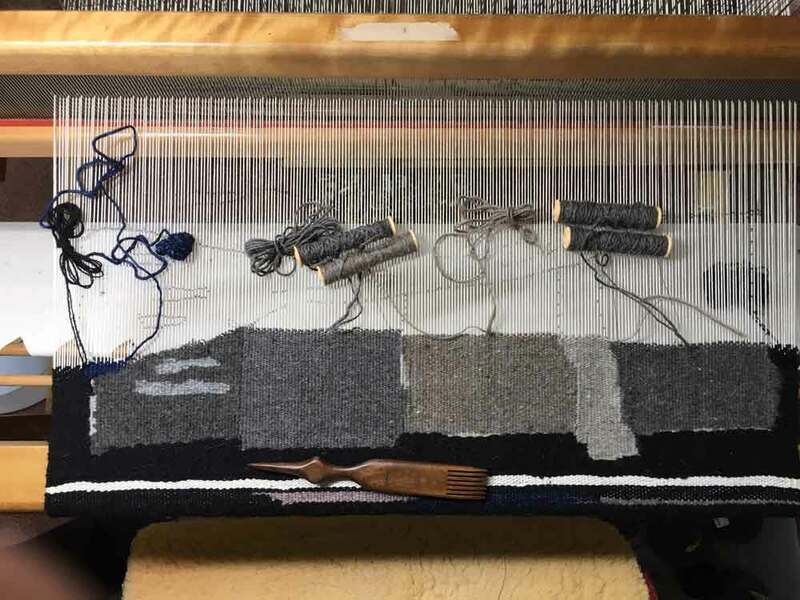 Yesterday I was excited to start weaving Mary's dark blue cloak--you can see a tiny wedge of it on the far left. This gorgeous indigo is also a New Mexican wool yarn. 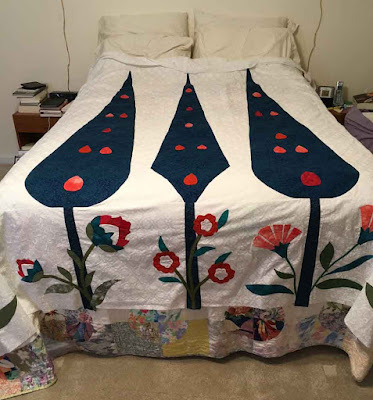 You quilters out there have probably given up on ever seeing me complete the queen-size quilt I started about 18 months ago, that's inspired by Turkish ceramic tiles . . . but the top is mostly done. I threw it on the bed, over the current quilt, just to see if the size was in right neighborhood. I have to applique some large shapes to the top edge, and piece the backing, and then it's off to the long-arm quilter. That will be a great day! I hope these mid-winter days are offering you a chance to explore new creative ventures too. 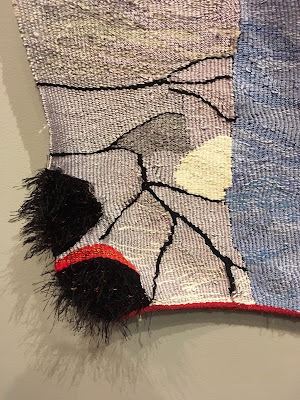 I had the immense pleasure of attending the opening reception and artists' talks for the American Tapestry Biennial 11 at the San Jose Museum of Quilts and Textiles last Sunday. I had purchased the catalog months ago, but when the chance arose to see the show in person, I jumped at it. I am SO glad I did. I was blown away by the impact of seeing the work in person. No printed reproduction can come close to conveying the texture, scale, technical detail and color of the original fiber piece. 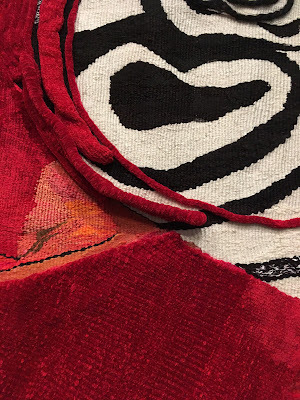 We--I, at least--see so much art on the printed page or online, that it's easy to lose sight of how essential those tangible, physical aspects are to our experience of the work. So most of the photos I took were actually detail shots of pieces, notes I was taking for myself about techniques, textures, and so on that I wanted to remember. I was also paying close attention to artists' use of color, since I'm going to teach a class this Sunday, 2/12/17, called More Color! at SEFAA, here in Atlanta. (It's not too late to register, but act fast). 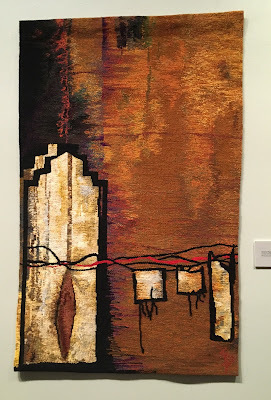 Suzanne Paquette, Cordes Sensibles, 60" x 36"
Back to the Tapestry Biennia. . . I loved the way the light areas in this piece, especially in the lower left, just glowed. It's not an area of solid white or ecru but a subtle blend of many colors blending and separating that makes it so effective, I think. Like many of us I'm instinctively drawn to saturated color. When I stepped in closer to look at this piece with its strong red, I was surprised to find high relief elements. 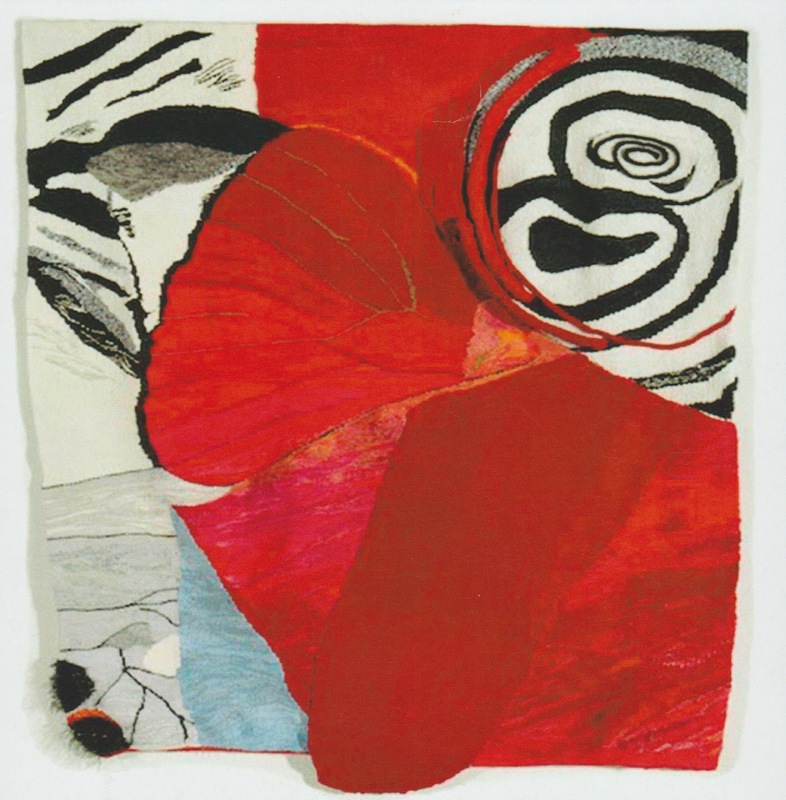 Rowen Schussheim-Anderson, Crimson Prelude, 52" x 48" x 3. 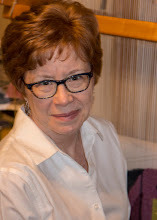 This photo by Ogy Blazevich is from the catalog so the colors are different from my detail shot below. There are actually separate woven sections attached to the surface! Like a collage! And fuzzy areas at the bottom left corner. 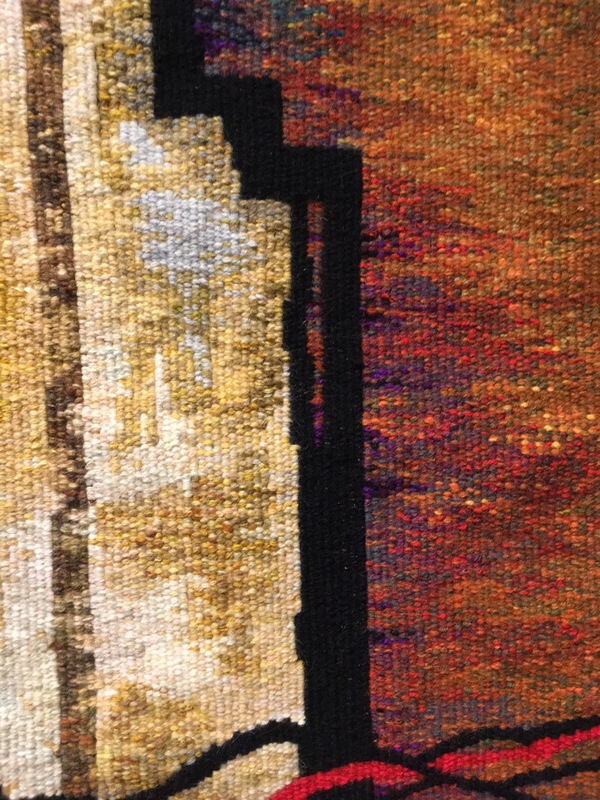 Lots of intriguing play with the conventional flat surface of tapestry. No account of this show can omit this piece. Its fine grain, large size, detailed imagery, subtle color and eye-catching subject held everyone's attention. 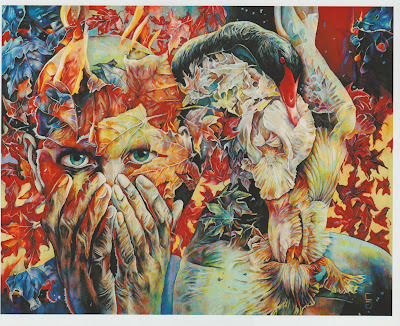 Gabriele Cristu, Romania, Prelude to the Afternoon of a Faun, 59" x 75". Photo by Daniel Gora from the ATB11 catalog. 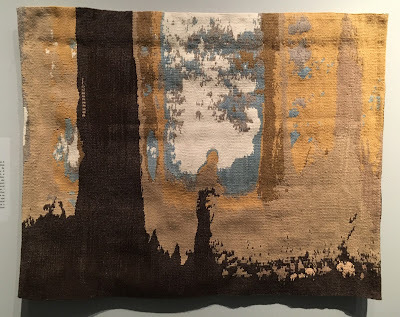 The color gradations are so subtle and the scale so fine that at the opening I was actually called upon by a small group of non-weaving viewers to explain how this was NOT a painting on cloth but actually was woven. I did my best but one of them remained highly skeptical. You can see in the detail below why it might be confusing. Finally I want to share a piece from another exhibit on view at the museum, a show by Tapestry Weavers West entitled Elemental Tapestry: Earth, Air, Fire and Water. This piece caught my attention because of its subject--I am a sucker for hiking anywhere but especially among redwoods--but also for its unexpected color palette. 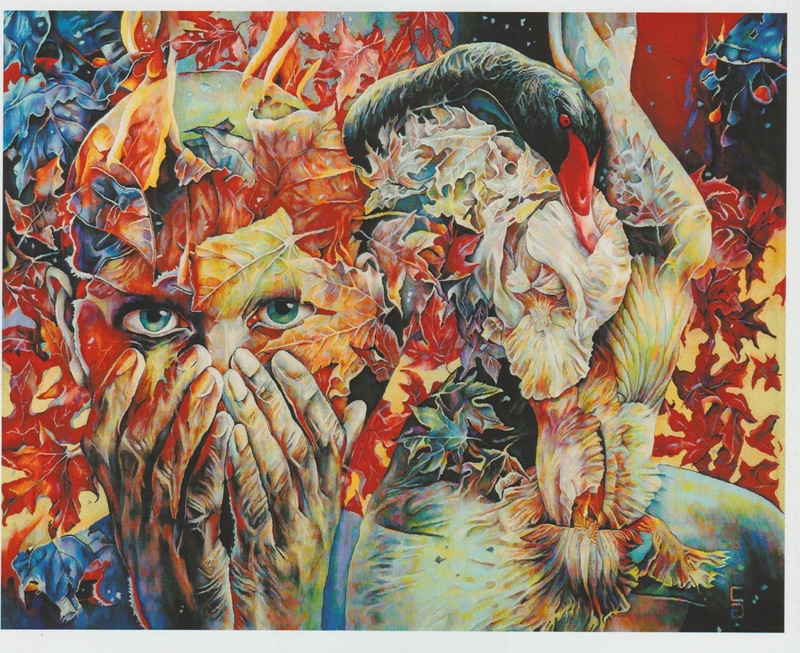 Ama Wertz, Ghost in Redwood Grove, 29" x 37"
Instead of using greens and other colors of the forest, Ama chose to use subjective color, color that conveys emotion rather than imitating reality. She also used naturally dyed wool from the area depicted in the piece, its "fibershed," which as she says "stamps the time and place a work was made directly into its structure and design." The value contrasts and the design itself carry the piece without saturated color. There are so many more pieces that I loved and could go on and on about. . . but that would make this post too long. As as Rebecca Mezoff mentions in her post about the show, these are just a few of the pieces that just happened to grab me this time. All of the work was excellent. If you want to see more, check out Rebecca Mezoff's blog post and video walk-through of the exhibit. Rebecca has done a fantastic job showing every piece and describing the wonderful artists' panel. She also has some shots of the 40-year retrospective of fiber legend Lia Cook's work also on view at the San Jose museum. You will not be disappointed. And if you want to learn more about how to use color in your own work, please sign up for More Color! next Sunday, 2/12, from 1-4 at SEFAA.